The Akita is a sizeable dog that comes from the north part of Japan. They were originally bred to aid in hunting larger game animals. As with any powerful breed, owners tend to lean toward strong names like Tank, Bowser, or Goliath. Some owners like to choose a Japanese name that is true to the roots of the breed. A few good choices are Iwa (meaning rock), Kaito (meaning ocean), and Kenji (meaning strong second son). 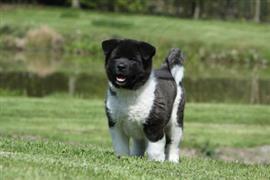 Akitas have a thick coat ideal for cold climates. The color and feel of the coat can inspire many potential names. Probably the most popular route is to come up with a personality based name that fits. The breed is known to be extremely loyal but typically has issues getting along with other dogs. Getting to know your puppy can help you draw relationships between behavioral traits and other things in your life. The best Akita names are derived from these connections. Some of our pages will contain a subcategory. A subcategory is a slightly more specific grouping than the main topic of the page. For a subcategory, we will include a separated table of names and corresponding descriptions. An example of a subcategory of Red Dog Names would be 'Dog Names Inspired by Red Wines'. If you have any subcategory ideas for the Akita Names page, we would love to hear them. Use the form below to submit your ideas.